Although we had no seniors in the Class of 2007, 2008 shows exceptional promise for Nichole Lopez. She graduated Alameda High and entered Clark University in August where she walked on to the volleyball team. Although she played club for the past few years as an outside/middle hitter, we first trained her as a setter. This experience was to her advantage as she is now the starting setter in the Clark lineup. For more details click Nichole's photo to see her bio, or click HERE to check out her stats. For more info click on Ashley's Photo. Ashley Lasher is off to Francis Marion University to suit up as a Patriot. FMU is in Florence, South Carolina and Ashley is looking forward to the collegiate atmosphere and playing under a volleyball scholarship. As a four year Starlings player, Ashley was selected team captain each year and received several honors and awards for her skill development and ETA. During the 2006 season, Ashley, who is normally our right-side hitter, stepped up to the challenge of being our primary setter. And she met that challenge head on --averaging 11 assists, 3 kills, 4 blocks, 3 aces, and 6 digs per game. 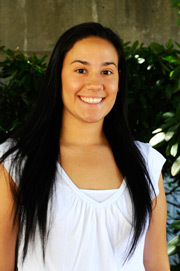 Ashley is an academic honor student maintaining a 3.7 GPA. Her tenacity, dedication, and commitment to team will make her an asset to the FMU program. We look forward to seeing her continued growth as a player. For more info click on Amy's Photo. Middle blocker, Amy Carnegie will be honing her skills at Holy Names University right here in Oakland. We look forward to supporting our homegrown athlete up on the hill at HNU. With two years of Starlings under her belt, Amy is a strong left-handed middle who is able to lead the attack with hitting as well as the defense in blocking. Amy often seemed ambidextrous in her ability to adjust and hit with her right hand with just as much power. She averaged 4 kills, 6 blocks (3 solo), 3 aces, and 2 digs per game. She is often mistaken for a quiet person but Amy really comes out of her shell when she steps on the court. Keep an eye on this "Big Lefty" at HNU. With 6 years as a Starlings club member, Aminah Asberry, took that experience to the court and was able to walk-on at the Coppin State tryouts. At the tender age of 17, she has a great deal of potential as a middle on the college level. Aminah averaged 5 blocks (3 solo), 3 kills, 1 dig, and 1 ace per game and we hope that she will continue to develop her hitting and blocking skills to be a key factor in the Eagle front line. Jasmine Frye (Libero/DS) and Aleesha Woodruff (Setter) will be going to Alabama State University on volleyball scholarships. They will join Starlings teammate Amecia Young as they suit up for the Lady Hornets Volleyball Team. With 3 years as a Starling, Jasmine's athletic potential will only be heightened by playing on the collegiate level. She has excellent court awareness and can be counted on to make key defensive plays and powerhouse serves. She averages 13 digs, 3 aces, 2 kills, and 1 assist per game. Not to mention an excellent serve receive of 89%. Aleesha is a 2nd year Starlings player and, as we say in volleyball, "she has beautiful hands". The strategy, quickness, and power of D1 volleyball will help her develop her game to the next level. We look forward to big things from this 5'3" setter. Tylease Robinson and Amecia Young, who are 2005 graduates, will be attending college in the fall on full ride scholarships. Amecia and Tylease were high school rivals for their league championship, but they were close teammates at Starlings. Both are happy to be going on to play college volleyball at the Division I level. Tylease graduated from Berkeley High School in June and will be attending Southern University. 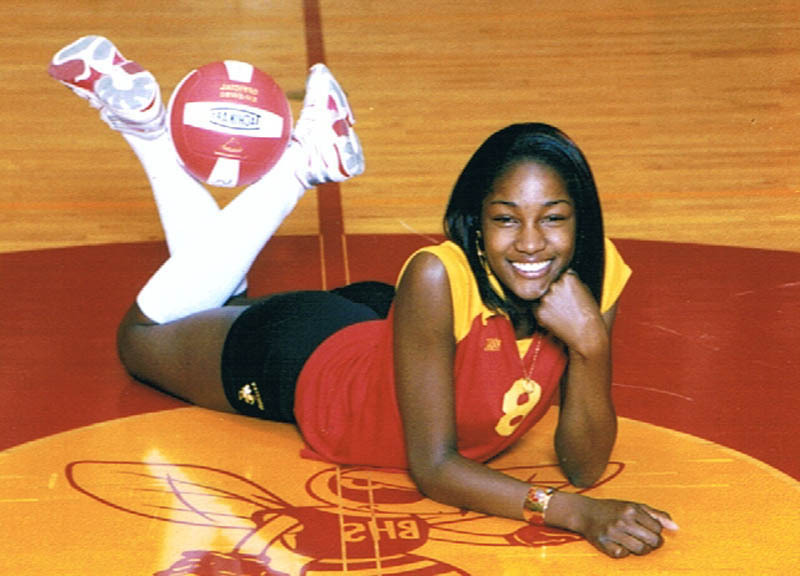 She was a starting outside hitter at Starlings and averaged 5 kills, 4 blocks (2 solos), 2 aces, and 4 digs per game. Amecia is a graduate of Encinal High School and will be attending Alabama State University. Also a starting outside hitter at Starlings, Amecia averaged 4 kills, 2 blocks, 4 aces, 3 digs per game. Although they will once again be at different campuses, they have vowed to maintain their Starlings sisterhood. WE WISH TYLEASE AND AMECIA ALL THE BEST! Danyel Davis graduated in June 2004 from Emery High School with a 3.0 GPA. 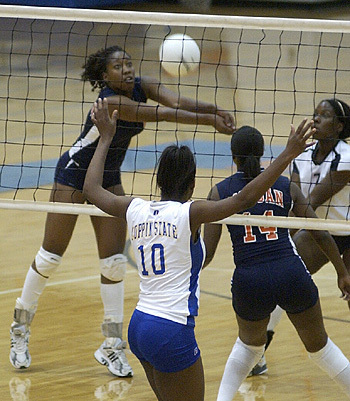 She is now attending Coppin State University on a volleyball scholarship. 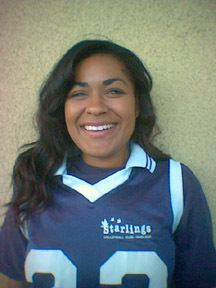 Danyel played for Starlings for two years and was able to get enough exposure to earn the opportunity to play college volleyball. Coppin is a Division I school and Danyel will be playing rightside hitter. 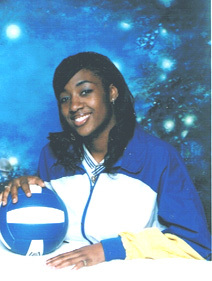 Danyel says, "All I ever wanted to do was be able to play volleyball in college. Starlings has given me the chance to fulfill that dream." At 6'3 and 14 years of age, Desiree Guilliard-Young was continuing to sprout. And although she had previously played basketball, Desiree was looking for a change. Along came Starlings Oakland and introduced Desiree to the game of volleyball. 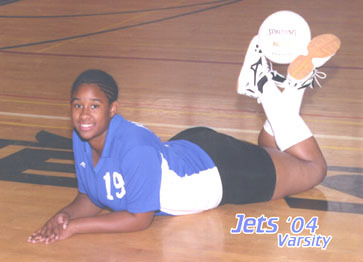 Playing club volleyball in the summer of '98 with Starlings gave her some fundamentals and insight into this new sport. From there, she went into her freshman year at Berkeley High with the love for a new game and has never looked back to basketball. She became a volleyball standout at Berkeley High, leading the team to second-place finish in the East Bay Athletic League as a sophomore and back-to-back Alameda/Contra Costa Athletic League titles during her junior and senior seasons, going undefeated both years. She also earned several league honors as well setting school, career and season records for kills and blocks. As a 2002 grad, she received a full ride scholarship to Baylor University. Desiree had a significant impact on the squad success and became the first player in Baylor history to record 1,000 kills and 600 blocks for her career. She was also named to the All-Big 12 Honor Roll. 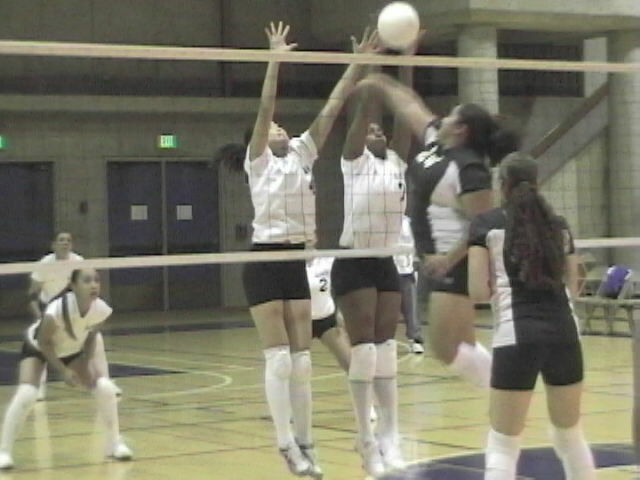 Bianca Turner blocking on the right for College of Alameda '03 against Laney. Anyone who desires to play volleyball in college - CAN. It just depends on what the individual player wants. And contrary to popular belief, regardless of your height you can play college level volleyball. Starlings Players can click on the title above for more information on recruitment and playing in college.